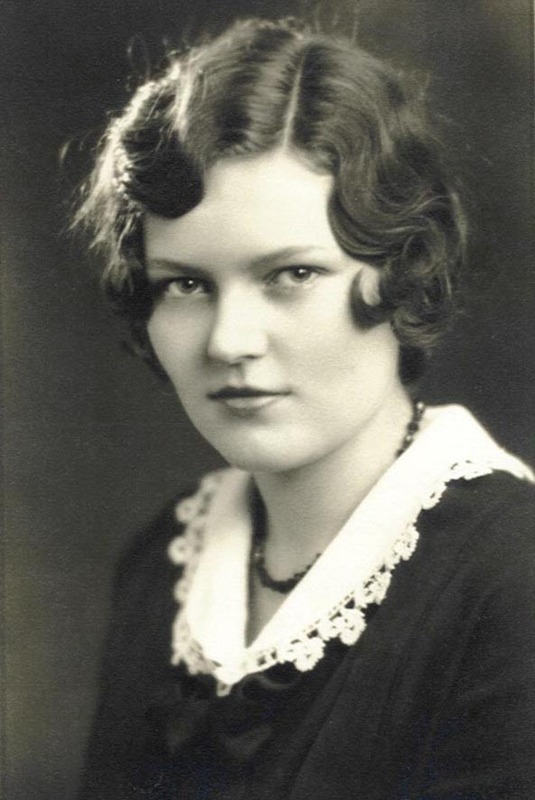 (informant) Death: She was an informant on the death certificate of Margaret "Maggie" A. McCarthy on 16 October 1924 at 5739 Ridge Avenue, Chicago, Cook County, Illinois, USA, at age 59; Died of cardiac exhaustion complicated by Banti's disease. Margaret A. Sullivan, nee McCarthy, wife of the late Peter J., beloved mother of Peter, Edwin, Frances, Genevieve, Mrs. J. V. Dunne, Sister Marie Aloysius of Order of Providence, and Isabel. funeral Saturday from residence, 5739 Ridge av., at 10:30 a.m. to St. Ita's church, where solemn requiem mass will be celebrated. Interment Calvary cemetery. Death*: She died on 6 June 1970 at Resurrection Hospital, Chicago, Cook County, Illinois, USA, at age 77. 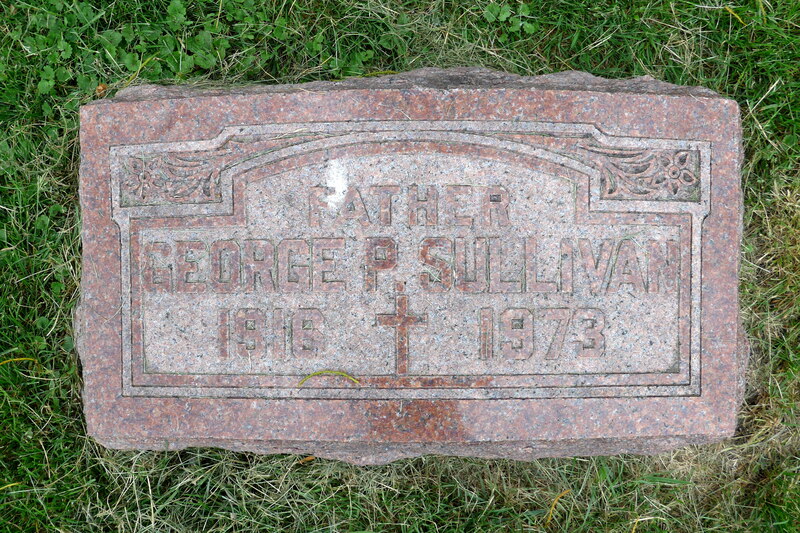 Genevieve I. Sullivan, June 6, daughter of the late Peter and Margaret; loving sister of Sr. Marie Aloysius, S. P., Marie Dunne, and Isabelle Stephens. Visitation at Birren & Sons Funeral Home, 6125 N. Clark street, from 5 p.m. Sunday, until the funeral, Tuesday morning at 9:30. Mass will be said in St. Jerome church, at 10 o'clock. Interment Calvary cemetery. In lieu of flowers, memorials may be made to the Resurrection Hospital Building fund. [S1638] Maria Sullivan, Illinois birth certificate no. 14837, FamilySearch.org, accessed June 9, 2012 (September 27 1892). [S1638] Maria Sullivan, Illinois birth certificate no. 14837, FamilySearch.org, accessed June 2012 (September 27 1892). [S1659] January 5 1920 US Census, Illinois, Cook County, Chicago, Washington, DC, ED 1561, page 5A, ward 26, Ancestry.com, accessed July 5, 2012. [S1652] Margaret A. Sullivan, Illinois death certificate. [S1744] Chicago Tribune, October 17, 1924, page 10, ProQuest, accessed June 9, 2012. [S1640] Genevieve (Maria) Sullivan, Illinois death certificate. [S1746] Chicago Tribune, June 7, 1970, page B21, ProQuest, accessed June 9, 2012. Death*: He died on 7 July 1963 at Augustana Hospital, Chicago, Cook County, Illinois, USA, at age 56. Mass for George F. Sullivan, 56, of 1515 Touhy av., who died Thursday, will be said at 10 a.m. tomorrow in St. Ita's Catholic church, 5500 Broadway. Mr. Sullivan was a cashier in the city treasurer's office for the last 22 years. Surviving are his widow, Jean; a son, Joseph R; a daughter, Mrs. Sue Brander, and three grandchildren. Chicago Tribune, July 12, 1963, page A2. [S1662] Joseph R. Sullivan, "William Joseph Brander Family Group Sheet", Printed from genealogy database. [S1721] George Francis Sullivan, Information Sheet, July, 2012 Elaine McIntyre Beaudoin, personal files, Information sheet provided by Joseph R. Sullivan, son. [S1599] Sullivan-Stevenson Marriage Certificate no. 1396563. [S1723] Joseph R. Sullivan, "Re: Parents' Marriage," e-mail to Elaine M. Beaudoin, February 1, 2013. [S1724] Chicago Tribune, July 12, 1963, page A3, ProQuest, accessed January 30, 2013. [S1722] Chicago Tribune, July 12, 1963, page A2, ProQuest, accessed January 30, 2013. [S563] Peter I. Sullivan, Illinois certificate of death. Death*: He died on 20 May 2011 at Walingford, New Haven, Connecticut, USA, at age 83. Gerald F. Sullivan, 83, beloved husband of Leonelda (Perkins) Sullivan, died peacefully at his home in Wallingford with his wife by his side on Friday, May 20, 2011. He was born in Hamden, May 26, 1927, a son of the late Patrick Sullivan and Mary Finnegan, he served as a Seaman First Class in the U.S. Navy in the Pacific during World War II, and as a 1st Lieutenant in the U.S. Air Force during the Korean War. A graduate of the University of Connecticut, he worked for many years as an Industrial Engineer for Winchester Repeating Arms in New Haven and Textron in Stratford. He enjoyed dancing, golfing, building furniture, and renovating the Wallingford home where he lived for 54 years. He was a parishioner of Our Lady of Fatima Church in the Yalesville section of Wallingford. An avid genealogist, he twice visited Ireland, the home country of his parents, to trace his family roots and visit relatives. He was predeceased by his brothers, James, John, Edward, and Vincent; as well as his sister, Elizabeth McGreevy. His family will receive relatives and friends in The Wallingford Funeral Home, 809 North Main St. Ext., Wallingford, Monday, May 23, from 4 to 7 p.m. Funeral services will be held Tuesday, May 24, at 9 a.m. when the funeral cortege will proceed to Our Lady of Fatima Church, where a Mass of Christian burial will be celebrated at 10 a.m. Interment, with military honors, will be in Sacred Heart Cemetery in Meriden. Birth*: Gladys Sullivan was born after 1903; Birth date assumed to be at least one year after marriage. [S765] Elizabeth Martin Grave card, Graceland Cemetery, Chicago, Illinois. Death*: She died on 29 September 2008 at Weiss Memorial Hospital, Chicago, Cook County, Illinois, USA, at age 94. [S442] 1920 US Census, Illinois, Cook County, Chicago, Washington, DC, ED 2125, Sheet 4A, Ward 33, (Ancestery.com http://content.ancestry.com/Browse/view.aspx). [S665] Elaine Beaudoin's personal knowledge Elaine McIntyre Beaudoin, personal files, In discussions with Helen McIntyre she told Elaine Beaudoin when she graduated. [S460] McIntyre-Sullivan marriage license: certificate no. 1557311, issued November 26, 1937. [S2282] 1940 Illinois, Cook County, chicago, Washington, DC, ED 103-1906; Page 2A, Ancestry.com, accessed September 13, 2002. [S927] The Garfieldian, February 13, 1941, page 3, Access Newspaper Archive, Institutional Version, accessed May 14, 2009. [S957] Letter, Lawrence F. McIntyre to Helen M. McIntyre, September 7, 1942. [S428] Chicago Tribune, February 14, 1965, p. S12. [S435] Lawrence McIntyre, Illinois State Death Certificate. [S461] Interview, Helen McIntyre, various dates. [S914] Helen Sullivan McIntyre, Illinois Certificate of Death. [S915] Chicago Tribune, October 1, 2008, Legacy.com, accessed June 24, 2009. [S665] Elaine Beaudoin's personal knowledge Elaine McIntyre Beaudoin, personal files, Blog created January 12, 2010. Death*: She died on 31 March 1988 at Resurrection Hospital, Park Ridge, Cook County, Illinois, USA, at age 85. Isabelle S. Stephens, new Sullivan, beloved wife of the late Guy F; loving sister of Marie Dunne; dearest aunt of Virginia Buchholz, Vivian Cunniff and James Sullivan. Funeral Saturday, April 2, 9:30 a.m., from Ryan-Parke Funeral Home, 120 S. Northwest Hwy., Park Ridge, to the church of St. Juliana. Blessing 10 a.m. Interment Calvary. [S1650] Isabelle S. Stephens, Illinois Medical certificate of death. [S1346] Cook County Clerk's Office, online http://www.cookcountygenealogy.com, Guy F. Stephens - Isabelle Sullivan marriage, September 9, 1949, file number 2101549. Birth*: James Sullivan was born after 1904; Birth is assumed to be after sister Gladys and at least two years after marriage.